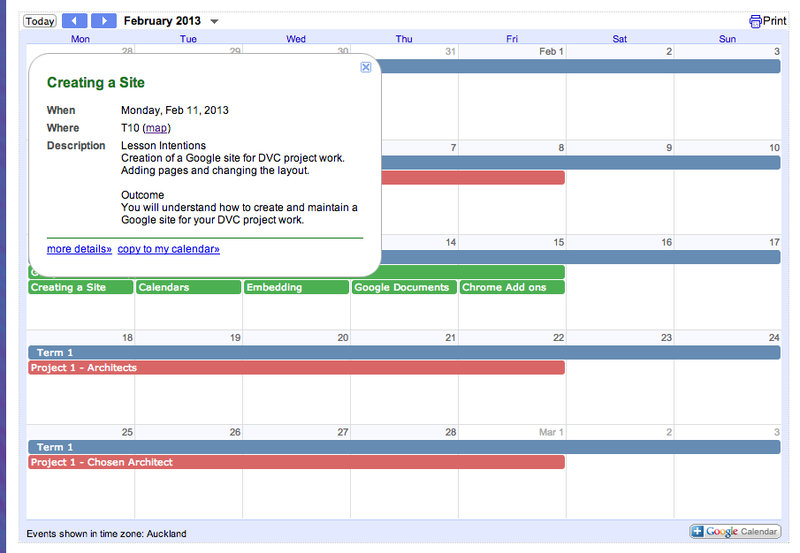 While working on my Google calendar today, getting ready for next year, I found a cool little thing. I filled in lesson information into the information section on an appointment. 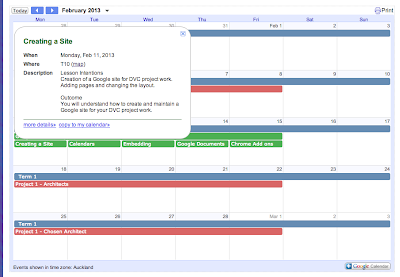 The calendar is embedded on the Graphics site and when you click on the appointment on the embedded calendar, it shows a pop up box with that information in for the students to see the lesson plan. I showed this to 3 different people and they all said, "oh, I already knew that!!". Gee thanks for telling me!! This got me thinking about the whole Google sites thing we have been going through this year. A lot of staff have had to be persuaded to open their sites to be seen by anyone with a school email address. They had previously had them private and put their students email addresses in to share just with them. A lot of staff had already opened them to the whole school. My site has always been open to the world as it has been used outside of school for example purposes. Personally, I have never had my course and lesson planning so open. It has been in folders on a shelf. It has been saved in folders on my school computer log on. It has been looked at by me, a HOD, maybe a member of management occasionally. Now, it is on the open internet for anyone to look at who wants to, both at school and anywhere else. I don't know why this has suddenly dawned on me today, as I was starting to put more detailed lesson planning on the calendars. Am I bothered? No not really, but I now understand the reluctance of those members of staff that must have realised this small point WAY earlier than me. Coming to terms with sharing and having it all "out there" in a totally non judgmental way is part of the whole thing we are going through at the moment.